"The ups and downs and fits and starts of the recovery continue. We know the Fed is on an exit path for QE, and we now have the warning shot that short-term rates will be rising in 12 months or less. For the moment, market participants remain sanguine about the prospects for both the timing and trajectory for rates, and we continue to wander about in a narrow range, and seem likely to for a bit longer yet. Summer doldrums are kicking in, with all the inertia that they bring to all things business, and there doesn't seem to be much that will push the market strongly one way or the other at the moment.Why are rates so steady? Economic improvement should be pressuring rates higher, but continued turmoil in the Middle East and the Ukraine has investors the world over seeking financial shelter in U.S. bonds. This week, we'll see if falling mortgage rates during the end of the spring sparked sales of new and existing homes (and to what degree), we'll get the latest from the Chicago Fed, orders for durable goods and a few other items to ponder. 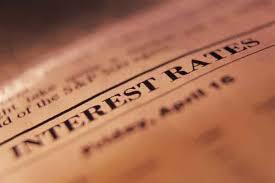 Mortgage rates are mostly holding in place, holding in a tight range which has persisted for better than two months. No reason to expect more than a wobble of a couple of basis points in average rates (in either direction) this week.